Lindsey Panassow pulls out a sheaf of pages torn from a notebook. Though the bundle, she admits, doesn’t look like much of anything, this is Lindsey’s Bible – the extensive lists of potential employers she collects while driving around Central Pennsylvania. “There’s a method to the madness,” she says. Lindsey is a career developer for the Vista Adult Services Organization (VASO). 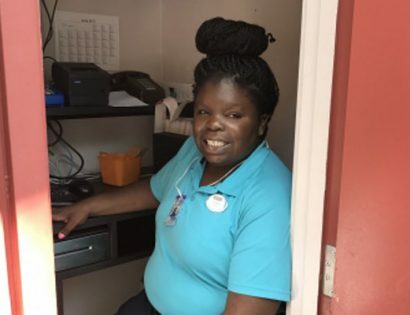 Her job is to match the unique talents and interests of her adult customers with autism to employers that have specific needs. 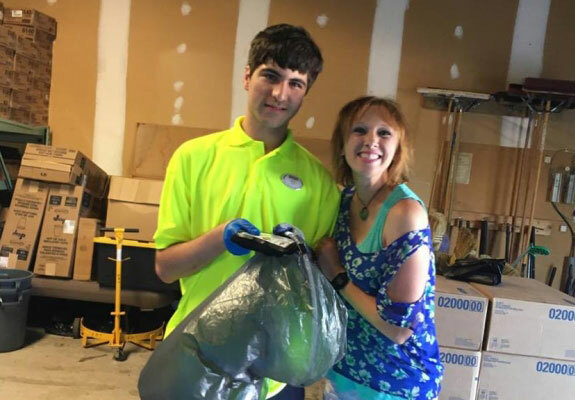 The process is officially known as “supported employment.” Vista’s employment team learns as much as possible about the customer while at the same time touring businesses. As in all things Vista, teamwork is essential. Career developers interview teachers for suggestions and brainstorm ideas with an individual’s life skills instructor, behavioral support therapist, and other team members. “Everyone has their own style,” says Lindsey as she sips a Starbucks Espresso before hitting the road. “Some people go about it logically – like it’s a puzzle.” Or the career developer might follow his or her gut instinct, if they have a feeling something will work. With contacts and networking, “things begin to click.” Before long, there’s an ongoing, mutually beneficial relationship. A former early childhood teacher, Lindsey understands the importance of spending a long time getting to know her customers. Both men pick up trash, but each has a customized set of accommodations to meet his unique needs. PP cannot wear his uniform on the way to work. CN will come in his work clothes, but he’s wearing the colors, not the actual uniform. For PP, the nametag is no problem; CN doesn’t like it. PP bends down to pick up trash; CN uses a picker. PP is easygoing; CN gets anxiety. The two have planned rest stops when they’re allowed to take a break in the shade and sit down by themselves. LB had opportunities to have several jobs, but she would politely decline them – “no, thank you, I don’t want to work today,” she would say. Hersheypark was different. “She wanted to work where her friends – PP and CN – were working,” says career developer Cathy Malloy. 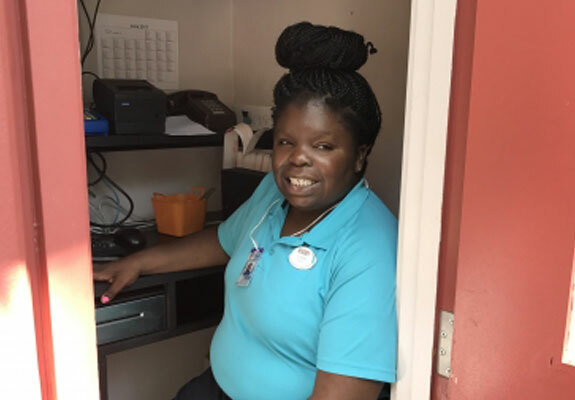 Cathy addressed the Hersheypark job as an opportunity to meet new friends – “she was going to help get the park ready so new friends can have a good time.” And that’s just what LB does. Each day she works, LB helps the front gate get ready to open. She places items where they belong. She dusts and cleans up the station. Then she does the mail run and sorts the mail as much as possible. She also fills the cabana bags with towels, sunscreen, and freebies. As much as LB likes routine, she likes being able to see different people and different settings – and socialize. “LB talks to everyone who goes by,” politely and using her great manners. • EK – The Weis bakery department in Carlisle has taken EK under its wing. The job appeals to EK’s creative side and got Lindsey thinking about similar cake-decorating opportunities. Now EK also works at Beeman’s Baked Goods, a small, family-owned Carlisle business. She goes to work by herself. • SR – At Kmart, SR straightens, stocks, and faces the shelves. He loves the toy section, particularly the hot-wheel cars. He likes dusting, too, so Lindsey has taken him on work trials to hotels. Kmart allowed SR to sign paperwork in the manager’s office, instead of in a large group, so Lindsey could read everything to him. • JB – JB likes to be moving all the time, but he doesn’t have much safety awareness. 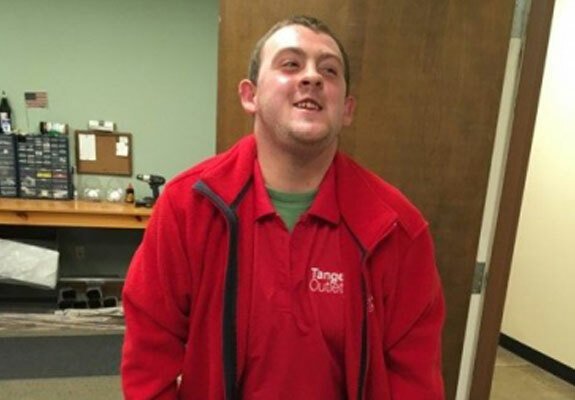 Lindsey helped him secure a job at a YMCA, a large organization where people are on hand to monitor his activity. • CL – In his maintenance role at the Hershey outlets, CL is responsible for cleaning up trash and cigarette butts. “The manager is awesome,” Lindsey says. At VASO’s Community Integration Center, CL sometimes uses attention-getting behavior. Now that he’s working, he has expectations to meet and is taking more initiative. • ST – Cathy noticed ST likes to run the vacuum cleaner. At the Paxton Street Home in Harrisburg, a licensed personal care home, ST sweeps two of the long, dormitory-style halls. To teach her to get all of the areas, the staff started by sprinkling baking soda. Now VASO has an intern who is an occupational therapist. She has taught ST to sweep one side of the hall, cut across, and go down the other side in a rectangle formation. • RM – Cathy took RM into Bob Evans to try unloading trucks. When the truck didn’t show up, Cathy asked, “do you mind if we work in the dish room?” A successful dining room trial at Elizabethtown College followed, but the college wasn’t hiring. “I decided to call restaurants in his local area,” and that’s how Cathy came across Chili’s in Harrisburg. 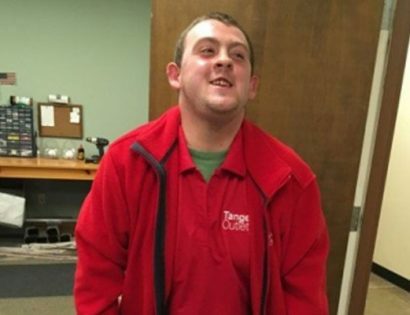 RM’s boss worked with someone on the autism spectrum at another Chili’s location. RM arrives before the restaurant opens and rolls silverware. He has increased his speed from two bins to three bins in a two-hour shift. And he gets to wear a cool Chili’s shirt!